The genetic underpinnings of treatment resistance in non-small cell lung cancer (NSCLC) are more complex and more active than researchers previously thought, according to findings presented at the 2017 Multidisciplinary Thoracic Cancers Symposium in San Francisco. 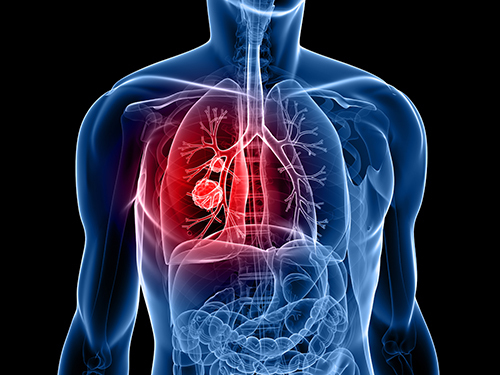 A research team analyzed 355 biopsied tumors from 221 patients who acquired resistance to EGFR inhibitors, the most common form of targeted therapy for NSCLC. Mutations frequently varied between biopsies, with nearly 1 in 5 patients (19%) harboring more than one type of genetic resistance to treatment simultaneously, the researchers found. While patients who acquire resistance to EGFR-targeted therapy may be designated as positive or negative for specific secondary mutations following a tumor biopsy, those patients are not routinely biopsied again. As a result, the initial prognosis often guides subsequent courses of targeted therapy—even as recent studies suggest that a permanent designation based on a single biopsy may be insufficient, as resistance in EGFR-mutant NSCLC can vary. “In the past, resistance mechanisms were usually thought of as static. Our study demonstrates, conversely, that a binary designation of resistance may oversimplify cancer's true biology,” Zofia Piotrowska, M.D., lead author of the study and a thoracic oncologist at the Massachusetts General Hospital Cancer Center, said in a statement. “These genetic mutations can fluctuate over time, and some patients can harbor more than one mutation,” Dr. Piotrowska added. She and colleagues published an abstract, “Heterogeneity and variation in resistance mechanisms among 223 EGFR-mutant NSCLC patients with > 1 post-resistance biopsy,” which was presented during the Symposium’s plenary session. Researchers examined tumor samples for various genetic causes of EGFR resistance, including the most common secondary mutation, T790M. The T790M mutation was found in 61% of patients, while the proportions of other mutations were as expected: 18% of patients had EGFR amplification, 2% acquired PIK3CA mutations, 5% had amplification of the MET gene, 3% transformed non-small cell to small cell disease and 1% acquired BRAF mutations. The overall distribution of resistance mechanisms was consistent with previous research. During post-resistance treatment, 83 patients (37%) underwent two biopsies. For about half of these patients (49%), resistance mechanisms varied between biopsies, including both gain and loss of the T790M mutation (20% and 11% of two-biopsy patients, respectively). Three of the 17 patients who lost T790M showed a new resistance mechanism on the second biopsy. All patients were seen at a single institution between April 2008 and May 2016. The median patient age was 59 years (range 28–88), and more than two-thirds (69%) of patients were female. “We hope that these findings will prompt clinicians to consider re-biopsy when selecting a new therapy,” Dr. Piotrowska said, adding that liquid biopsies may provide another method to more easily characterize resistance over time.